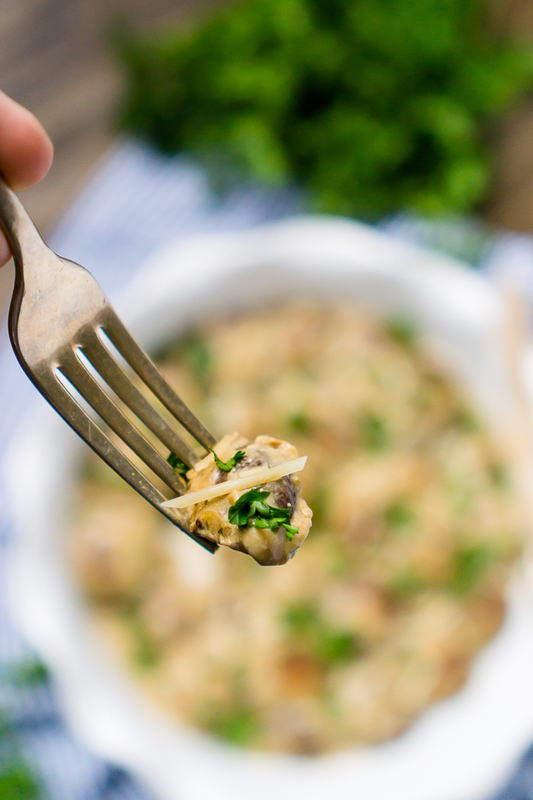 Delicious Garlic Mushrooms are an Easy Side Dish Recipe Ready in Under 15 Minutes! Want to know a little secret about me? I used to hate mushrooms. We never had them growing up because my mom didn’t like them, and, as a kid, the texture just weirded me out. My husband is a big mushroom fan though, and I realized pretty early on that I would need to at least give mushroom recipes a chance. Here we are 10 years later, and I love them! I usually just saute them a little with oil or wine when we have steak or I make stuffed mushrooms, so I thought it was time to broaden my cooking horizons and make a new mushroom side dish recipe for us to enjoy. My kitchen experimentation resulted in these Creamy Garlic Mushrooms! Like most people probably, we tend to have the same side dishes in rotation for our meal planning, and it gets a little boring – steamed veggies in the microwave, mashed potatoes, rice, etc. The faster the better usually between our work and parenting schedules! However, that’s boring! I’ve taken it upon myself to add new side dishes into our rotation that adds a bit more flavor and fun to our dinners, and that also test both my husband and I to try new things the other likes. For example, for me I’ve been making more salads, like a tossed caprese salad or shredded Brussels sprouts salad, and oven roasted Brussels sprouts (I really like Brussels sprouts!). 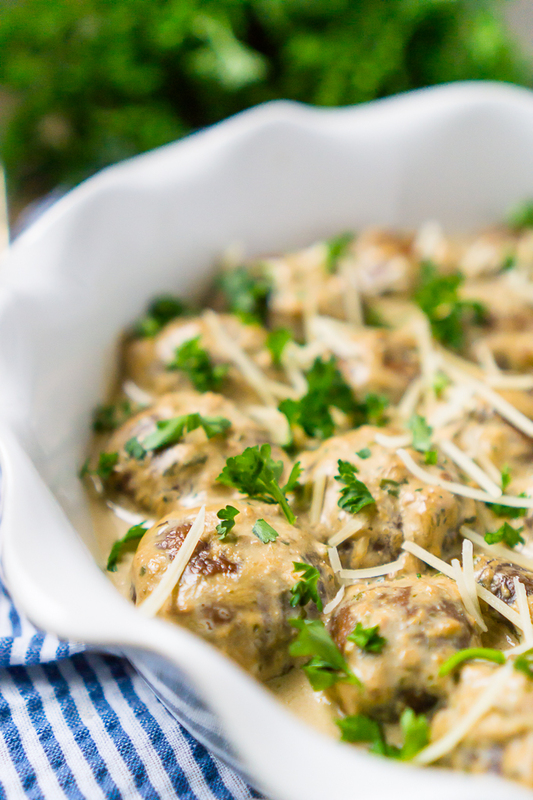 For my husband, I made these Creamy Garlic Mushrooms! This also goes the same for the extended family’s holidays! It’s usually the same side dishes for each holiday every year. My sister and I were just talking the other day about adding in a new Thanksgiving side dish but, of course, then comes the question about what side dish to remove and the inevitable family debate that would ensue. The love of corn goes very deep for some of my family, including my husband. With a picky eaters, it can get tricky. So no, these Creamy Garlic Mushrooms won’t be making the Thanksgiving table this year even though we personally love them, but hopefully your family has mushroom lovers like us! If not, make them for dinner while some chicken or pork bakes in the oven. It really is an easy side dish for two or a small family. 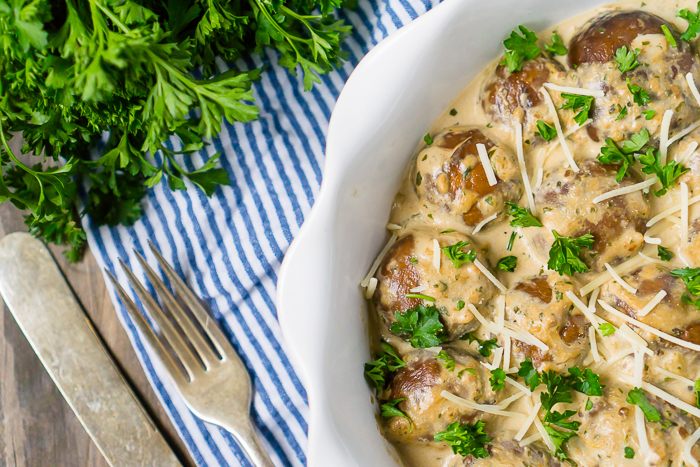 Time to Enjoy a New Creamy Garlic Mushroom Side Dish!